One of the few times we actually went out to eat in San Diego while visiting the Western Casa McBardo was at the Stone Brewing Company (the website strangely enough needs age validation). A brewery with a family friendly restaurant which has regular growler refills - it's a very interesting place. The food was pretty good, if a bit of a safe bet. But there was one aspect which bothered me a great deal. And that is that they served us tea from a French press. First of all, tea can't be treated like coffee. 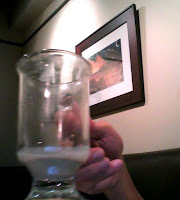 By pressing down on the leaves, the waiter extracted the bitter compounds from the leaves, thus making the initial pour all right, but subsequent pours undrinkable. And what's worse is that this is a press that had been used to make coffee before. The carryover contamination is unmistakable. And distasteful for people (like me) who don't like coffee. I do think that this is just symptomatic of cultural false dichotomies. Many French chefs will automatically prepare eggs for someone who is vegetarian, because that is the obvious alternative to meat. If you don't like wine, of course you must be drinking beer. And if you don't like coffee, you must be having tea. Problem is, places like Stone, which is a nice establishment, don't get me wrong, don't understand or respect tea as an ingredient in its own right, and requires treatment of its own. Like in many stores, tea is lumped in as the poor deprived cousin to coffee, languishing in the aisles as cheap tea bags are sold next to gourmet whole beans complete with presses and espresso makers. Tea in and of itself carries a history of optimized preparation; not that one should expect a Japanese Tea Ceremony every time, mind you. I'll bet that if customers complained about a bad capuccino, management will readily do it over, but bad tea is a shrug, sorry that's the best we can do problem. Never mind the Starbucks attempt at tea "lattes". Incidentally, I've been to three teahouses in Houston: Te House of Tea, Path of Tea and Serenitea. It's high time I repaid a visit to the the last one. I think American restaurants in general don't respect tea. Canadians are only slightly better, but I think one must travel to Europe or Asia to find folks who respect tea as something worthy of perfecting. I agree, tea is often an afterthought and many establishments offer zero selection - hello Lipton. Sometimes very upscale/high end restaurants offer proper tea service at the end of the meal; not sure which here in Houston may do that. I meant to mention this earlier... Some coffee makers (such as the Bialetti Brika) actually prize the oily residue left behind by coffee. These coffee makers actually need to be primed much like a cast iron pan, burning on the coffee oils. The first few coffees you make aren't very good, but after a while it gets better and better. (And you only ever wash the pot with water - never soap). You know, the same thing is true of tea pots - that they should be primed and the residue is prized. All the more reason why one should keep the vessels separate.